Focusing on the advantages homeownersgain by planting certified seed is important. Certified seed is tested, inspected and graded by accredited experts to ensure excellent germination, pest and drought tolerance, and much more. By using certified seed you can be certain you are receiving the best quality product. It all starts with certified seed. Why settle for less? To see the answers to more questions like this, view our FAQ flyer! To learn about about grass seed types and benefits to a healthy lawn, view our lawn care flyer! To learn more about Endophytes view our information flyer! Before planting a lawn, it is important that the area has an adequate covering of topsoil. A minimum of 8 inches is best. A good topsoil base will allow the lawn to establish a strong root system. The topsoil should be leveled to minimize depressions, or low areas in the lawn. This will prevent water from pooling on the lawn, which may lead to drowning out and winter kill. Before seeding, the soil should be worked until it is reasonably fine. The soil should not be worked unless it is dry. Working wet soil will lead to soil compaction and cause hard lumps to form. The seed should be spread evenly at the recommended rate. To ensure that strips are not missed, the seed should be spread in two different directions. This can be done by spreading one half the recommended rate in one direction, and the other half in crosswise direction. Once the seed has been spread, it should be shallowly mixed with the topsoil. Mixing the seed and the soil with the backside of a rake can do this. It is important not to plant the seed too deep. Deep planting can lead to poor emergence. A planting depth of 1/8 to 1/4 inch is ideal. After seeding, the area should be packed with a light lawn roller. The soil should then be kept moist, however overwatering should be avoided. If the lawn is overwatered, the emerging seedlings may become diseased and rot off. Intense overwatering may also lead to seed being washed away by irrigation runoff. 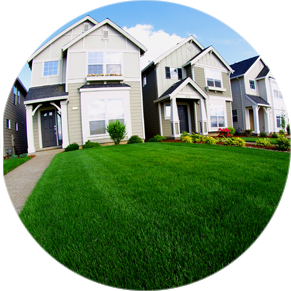 A home lawn should not be cut shorter than 1 inch, to maintain the best appearance. 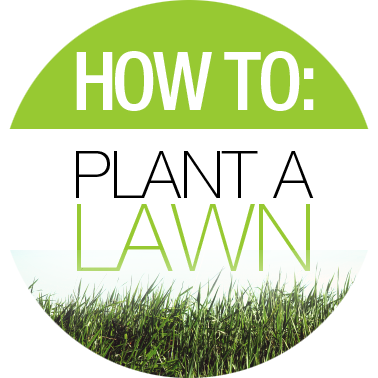 If there are areas in the lawn, which are bare or thin, overseeding will help improve the appearance. For overseeding, a rate of double the normal seeding rate should be used. A good method is to mix the required amount of seed with four times that amount of topsoil and the spread this mixture over the thin area. This should be lightly rolled and kept moist until the grass has established. A recommended fertility and herbicide program should be followed each year to maintain a healthy, green lawn. The best time to seed a lawn is either in the spring (Mid-May to the end of June) or in the fall (Mid-August to Mid-September). Seeding during the middle of the summer should be avoided due to lack of moisture.